A proven process for finding your dream job in Norway. Landing a job in Norway is the most difficult hurdle to overcome as a newcomer to the country. Even the most experienced expat has to compete against a highly educated workforce with near-native English language ability. But there is a way through! 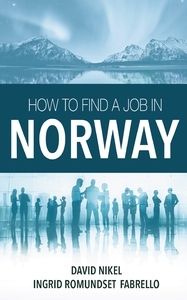 By following a proven strategy, this book will help you to: - Understand the job market in Norway - Find the job vacancies best suited for you - Discover what Norwegians are looking for in an employee - Succeed with the job interview by knowing exactly what to expect - Avoid the most common mistakes made by foreigners Norwegian employment and recruitment expert Ingrid Romundset Fabrello has years of experience leading workshops and one-on-one consulting to help English-speaking foreigners in Norway land a job. She shares her expertise and very best advice from helping a diverse range of foreigners into the Norwegian job market. Her co-author David Nikel has spent seven years running a website for foreigners in Norway, and has been through the recruitment process himself several times. He receives questions and hears stories from his fellow expats on a daily basis, so understands exactly what the challenges are. Whether you’re a single professional dreaming of a new life in Norway, or a trailing spouse looking to fill your days, How to Find a Job in Norway will help you hit your employment goal.